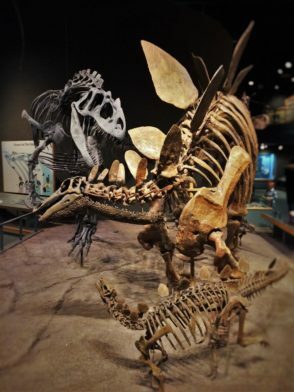 To be honest the reason we went to Denver wasn’t actually for my cousin’s wedding… It was actually to go to the Denver Museum of Nature and Science. We are dads. That means that we have kids that love dinosaurs. 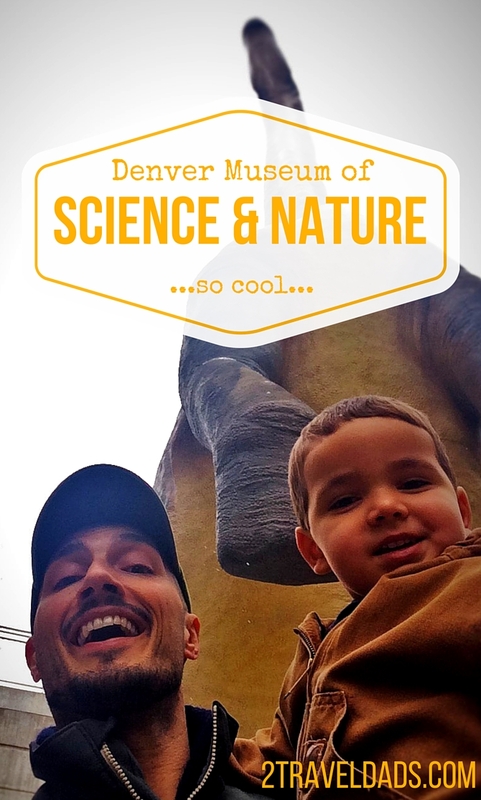 We needed to see dinosaurs when we went to Denver… So badly. 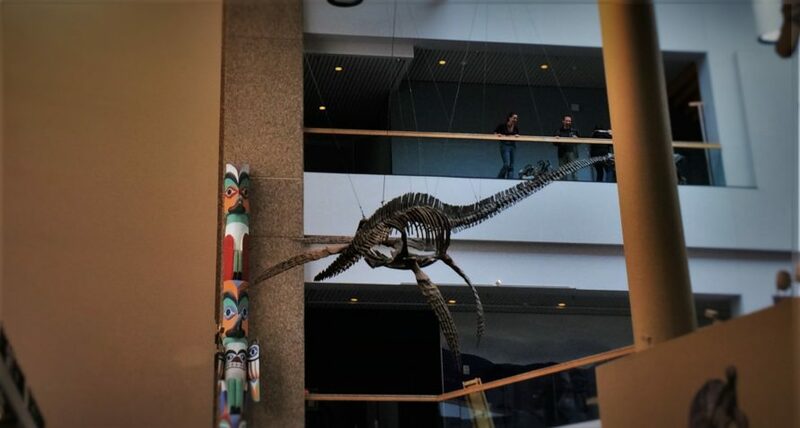 The Denver Museum of Nature and Science was great. Strike that: it was amazeballs. And that’s why we’re sharing it with you. 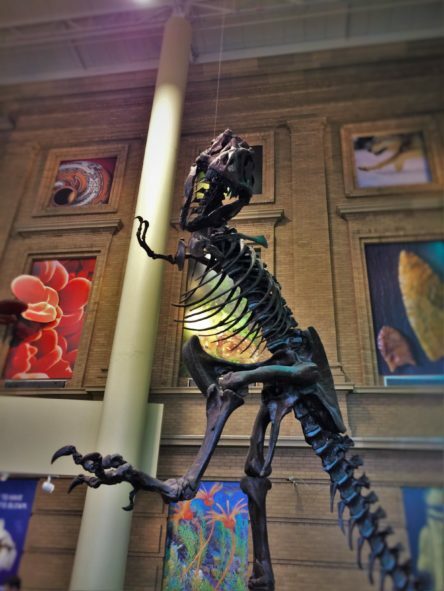 So that you can plan and actually get everything that you’d like to out of the Denver Museum of Nature and Science. Gosh, next time we go I feel like we need to spend an entire day there from opening until it closes. 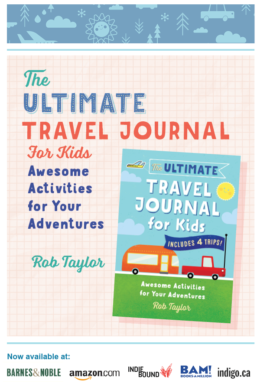 The kids might be tired by the end of it, but the dads sure will enjoy it. 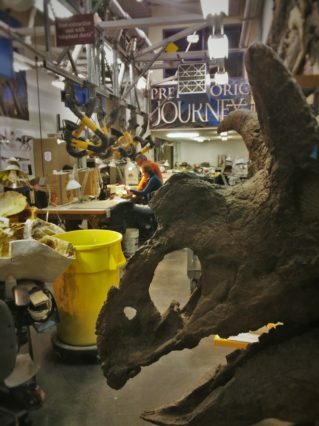 Why we were there: Dinosaurs!! Thank goodness it’s not in downtown. The Denver Museum of Nature and Science is outside the downtown core at the City Park. This also happens to be where the Denver Zoo is located. The City Park is a really beautiful place with ponds, trees and walking trails. Oh, and the Museum of Nature and Science and the zoo. Basically, the City Park is huge. 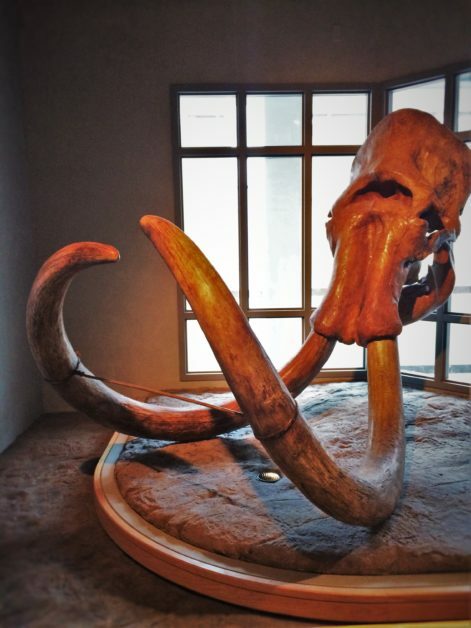 While you could try doing street parking or use the VERY LARGE zoo parking lot, it’s worth it to park in the garage or lot right next to the Denver Museum of Nature and Science. Why? Because there are dinosaurs in the parking garage!!!! For realz. I believe we encountered an apatosaurus and velociraptor before we even got the the ground level of the garage. For that alone, try to park in the garage. Tip: arrive as close to opening as possible as the lot and garage fill up quickly and the traffic management above ground isn’t well executed. 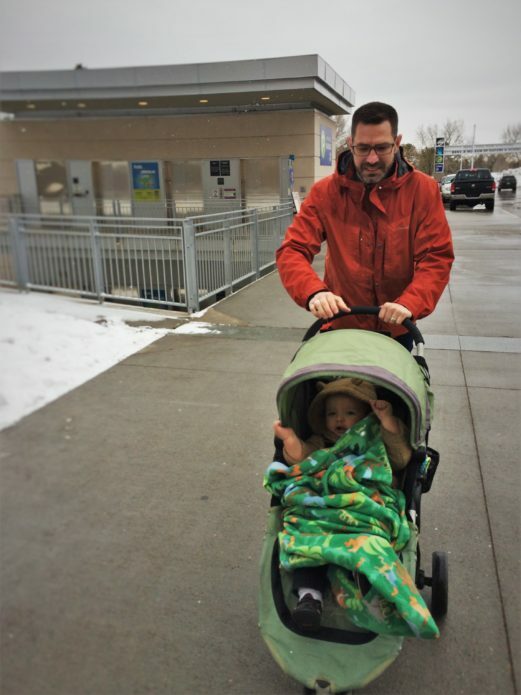 If you’re later in the day, use the zoo parking lot and walk the five minutes to the museum. Like any noteable museum of any sort all around the world, there are exhibits that make pit-stops here and they’ll be an additional fee. Also, there are special movies and IMAX presentations that you can purchase tickets for ala carte. 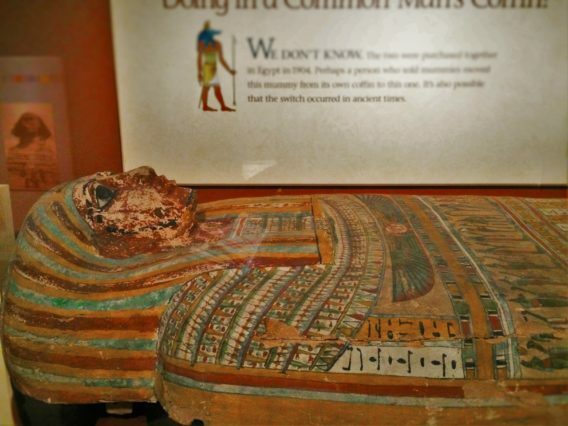 Also, if you’re local to the Denver area or visit the city more than once a year, take a moment to see if you should actually purchase a membership to the museum. Tip: purchasing a membership might be a better deal than you realize. 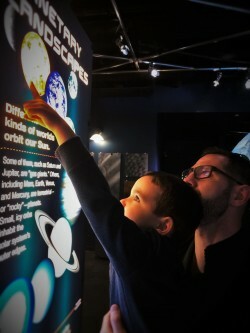 Membership also gets you into oodles (330+) of other science centers around the country. 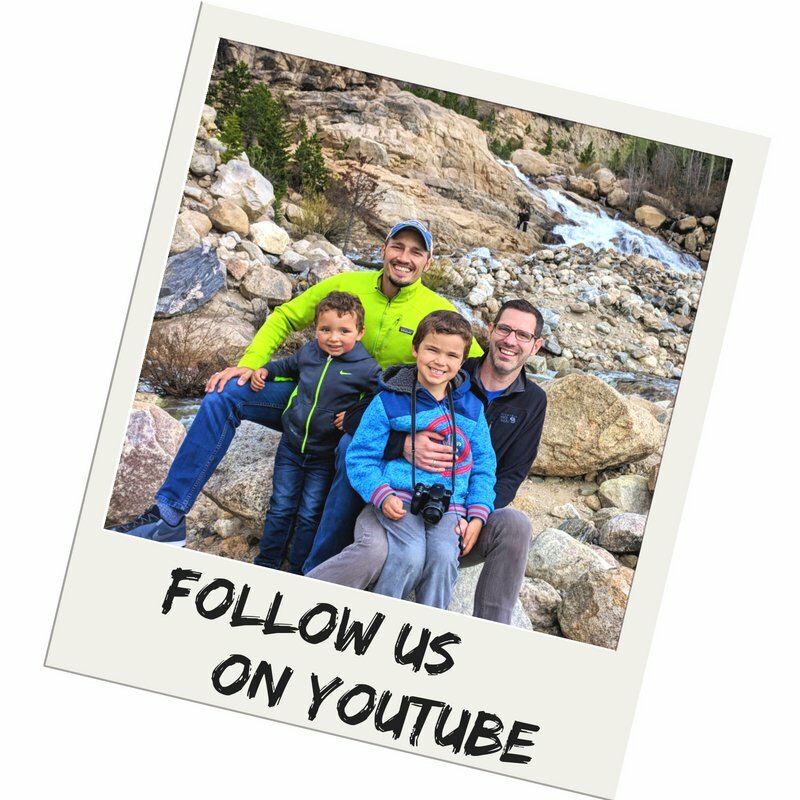 Bonus tip: if you’re a member at someplace at home, check if you already have free admission to the Denver Museum of Nature and Science. That’s right. 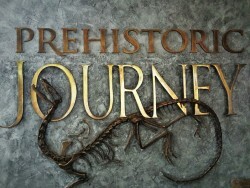 Our focus was on the Prehistoric Journey exhibit. 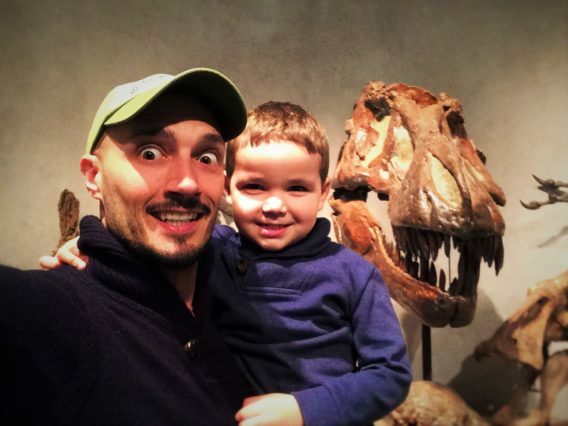 We had NEVER visited a dinosaur exhibition of any sort ever before this so we had no idea what to expect. Do you know what? That’s our new favorite way to experience an exhibit. There were no expectations ahead of time so we didn’t know if we were seeing an awesome collection or something totally lame. Well, actually we know it wasn’t lame as there were so many parts to the exhibition. 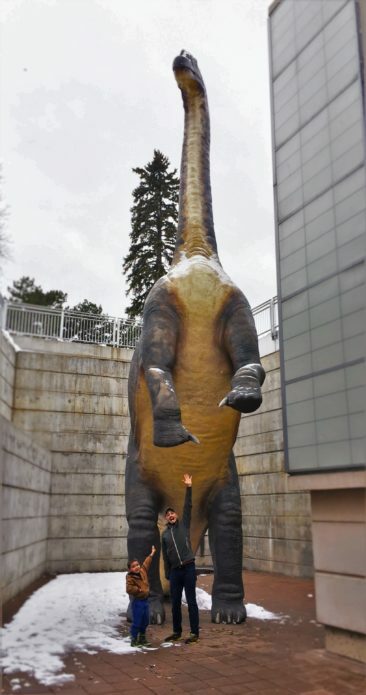 The Denver Museum of Nature and Science knows how to do a dino-show. 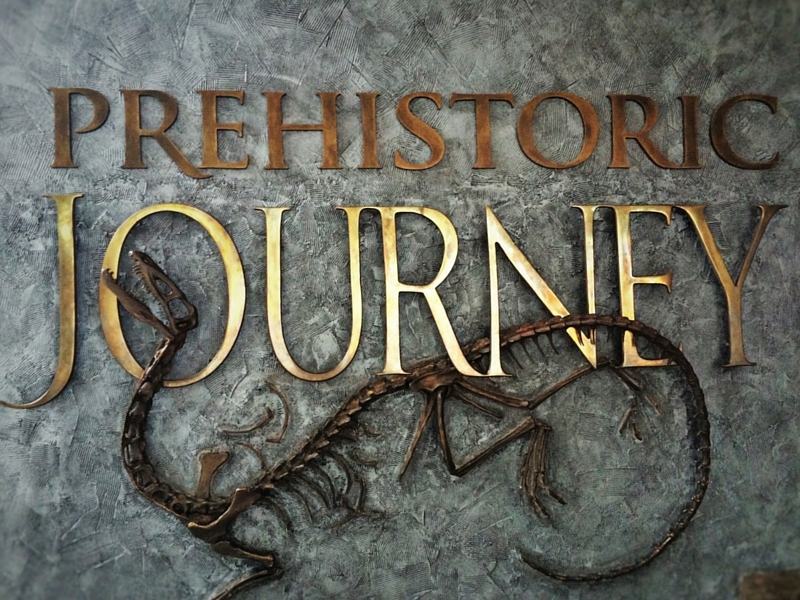 The Prehistoric Journey starts with pre-dinosaurs and then continues beyond them. 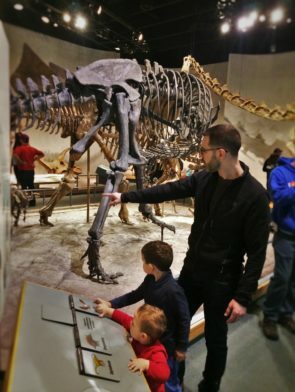 It’s fun to think about actually because the exhibition is set up like an actual story from micro-organisms to the scientists working on fossils. It’s totally a storybook diorama and you get to be a character. Docents dotted the exhibit from start to finish. 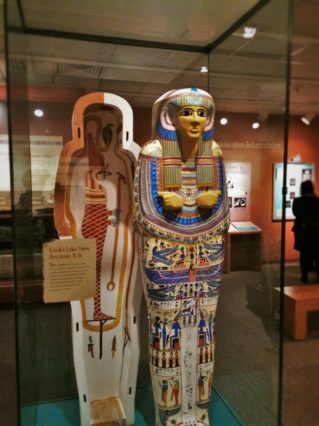 What’s a docent? Well, it’s a volunteer who has knowledge and love to share. 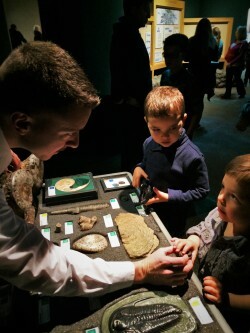 A docent is a pre-doctoral student sharing the stories of early nautilus and snail with your four year old. 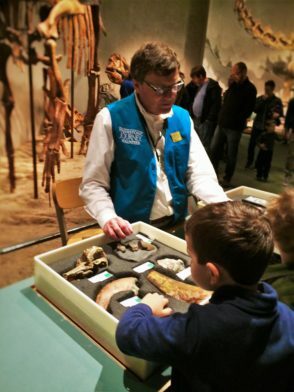 A docent is the retired paleontologist handing your 18 month old dinosaur poop and treating him like an adult museum-goer. Docents are amazing people who are often unpaid volunteers that just want to share their joy with kid and adults alike. The docents at the Denver Museum of Nature and Science were incredible and so very patient. They need a medal for patience. The assembled skeletons were incredible!! For us adults who had never seen dinosaur bones before, we were in awe. There were small raptors to a humongous diplodocus. There was an allosaurus attacking a stegosaurus. T-Rex. OMG. Funny story: you don’t know trauma until you’ve shown your child the bones of their most beloved cartoon characters. If you’ve seen the show Dinosaur Train on PBS… DON’T LOOK UP. Shiny, Tiny and Don are flying overhead in the exhibit. So sad for a four year old. Tip: maybe just share that you’re viewing art vs view things related to death. Apparently our oldest is more sensitive to death-related subject matter than we thought. Maybe gauge it strategically before walking into an exhibit all about it. The Space Odyssey exhibit was really cool!! We hit it last and didn’t get to do everything, but seeing huge globes spining and changing was worth just the walk through. 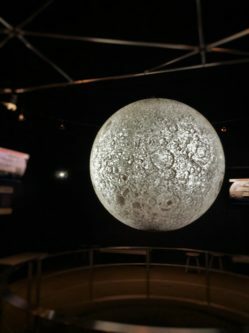 We did get to learn a bit about the sun, about space-exploring land-rovers and about other planets’ moons, but we didn’t get to see everything. We could’ve spent more than an hour in this small section because it was surprisingly hands-on. So much more. 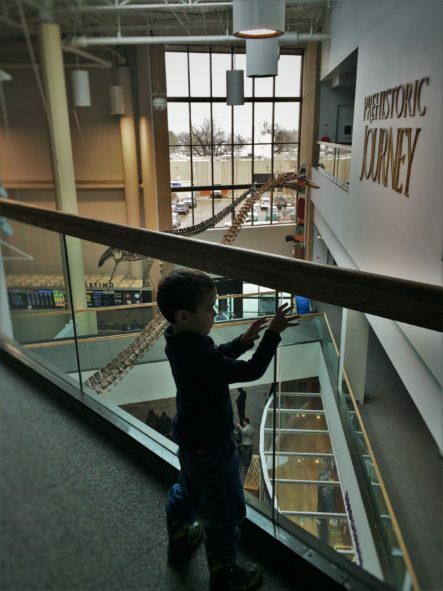 We didn’t get to explore half of the Denver Museum of Nature and Science. 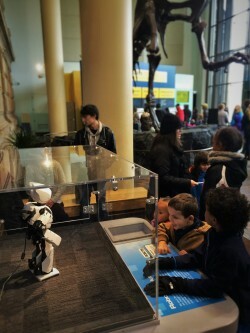 I personally wanted to explore the minerals and gems exhibit as well as the robots, but time didn’t allow. Next time…. There are so many types of exhibits at any given time. While we were there we could’ve learned about chocolate or robots (I keep mentioning the robots), but those are on rotation. 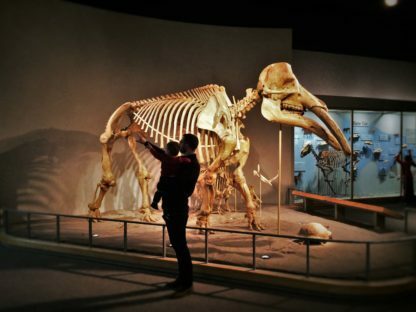 Permanently, and what we’re looking forward to next time, there is a huge wildlife exhibit, featuring many taxidermied species in their environments, including more skeletons. Visiting the Denver Museum of Nature and Science is worth investing a whole day. You can bring your own lunch or buy lunch at the museum restaurant, but based on our museum and aquarium experiences, you want to bring your own lunch. And since you’re so close to the zoo, you could swing through there too. Warning about the zoo though: it’s not good if you’re sensitive to seeing animals in captivity, as the enclosures are not appropriate if you’re going to keep large animals in confined spaces. 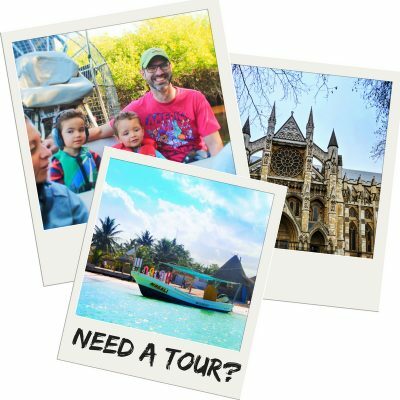 The aquarium portion of the zoo is awesome (why we went there) and it’s well worth the time. We were glad the Denver Museum of Nature and Science welcomed us and we can’t wait to return. 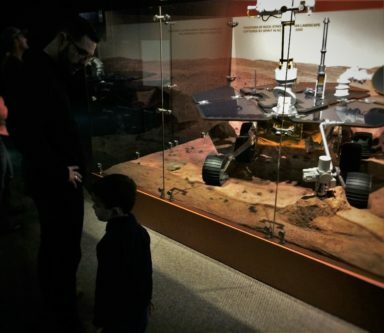 Next time it’ll be even better as the kids will be older and ready to learn and explore even more. To check out where we stayed, see our article on the Inverness Hotel. 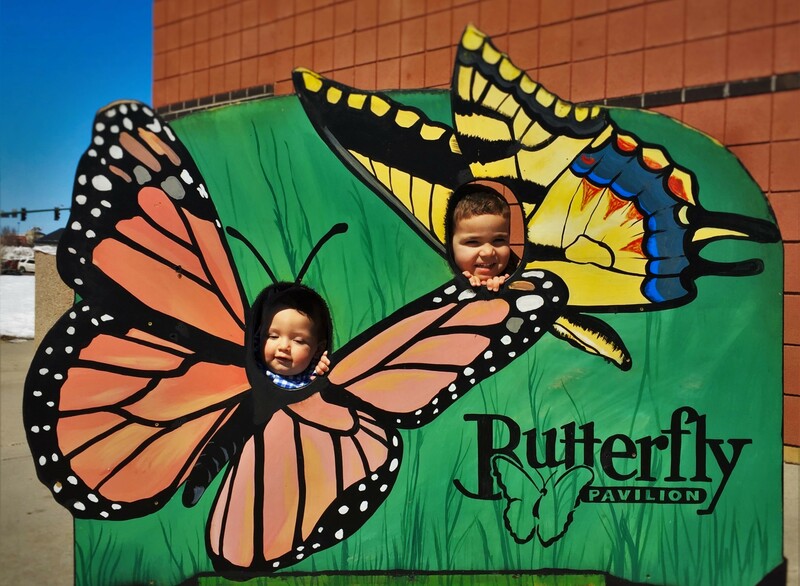 It’s about 20 minutes from the Denver Museum of Nature and Science and was perfect for family travel. Sounds like a great day, too bad you didn’t get to enjoy it all. At least the dinosaurs were a hit with the kids even if the mummies weren’t. 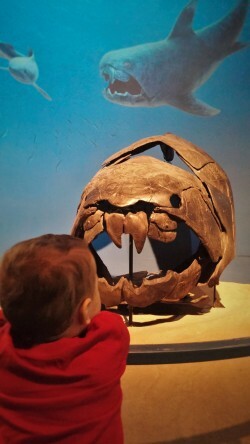 Great experience and a good exposure for kids, though they may be scared at first. Dinosaurs are always a terrifying and at the same time fascinating subject. You just can’t lose with Dinosaurs! My kids would go bonkers there! Dinosaurs !!! They are just fascinating and the Egyptian sections too, seems like fun. 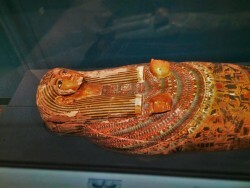 Got me back to my visit to the British museum. That looks like one heck of a museum. I love museums. My favorite one’s an interactive Viking museum in Dublin, but I think this might easily better that! Even at age 4, I think they would have enjoyed the Discovery Zone, a permanent area catered to kids probably 6 and under. 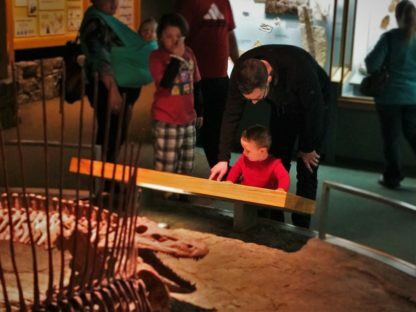 You can “dig up” and discover dinosaur bones in a sand pit, explore water play with a huge water table, and learn about construction and other themed lessons in the room at the back. We bought a membership JUST for this. The taxidermy animal exhibit is also great for kids because they have interactive buttons at most of them with corresponding animal noises or other information.